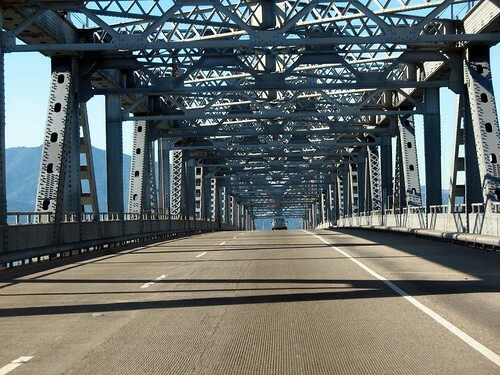 The bay area is home to a handful of bridges. The outside world knows two, the Golden Gate and the Bay Bridge. 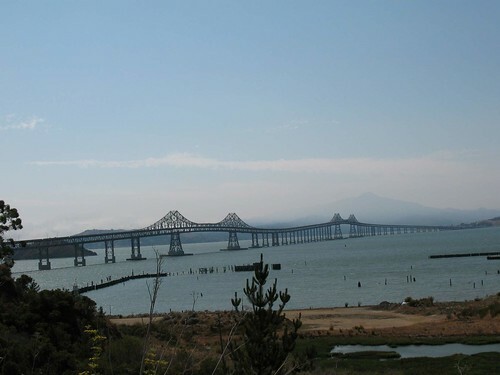 I would like to introduce you to another one: the Richmond-San Rafael Bridge that connects the city of Richmond in the Contra Costa County and San Rafael of Marin County. 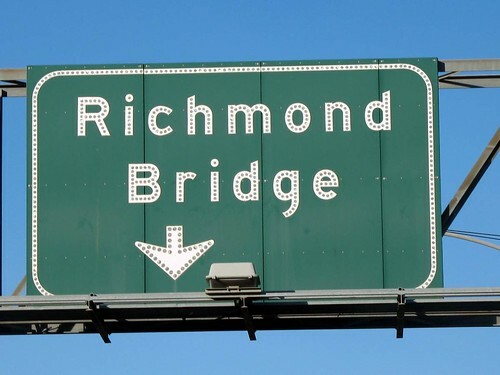 The sign says Richmond Bridge and that’s what the San Rafael side calls it. It is offiically called John F. McCarthy Bridge. I don’t know who he is honestly. 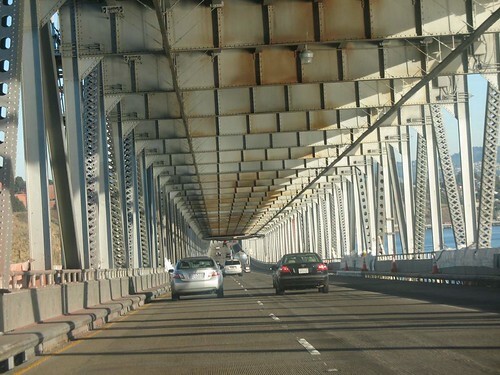 But on the Richmond side, we call this bridge San Rafael Bridge. 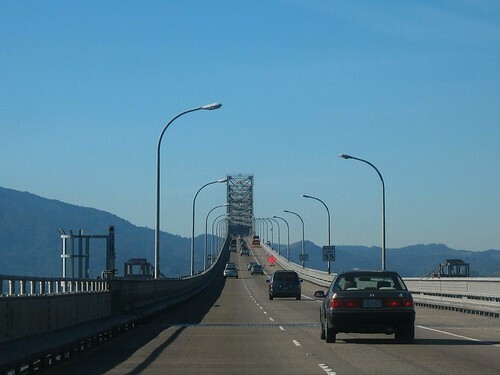 It is a mystery why on our side we call it San Rafael Bridge and on the other side they call it Richmond Bridge. The bridge is double decker. The upper level is San Rafael Bound. My husband and I often cross this bridge to go to Point Reyes National Seashore. This is a closer look at the upper deck. The bridge measures 5.5 miles, and just finished some retrofit work. This is the shot on the lower deck on the way back to Richmond. This is taken from Point Molate on the Richmond side looking southwest toward Marin County. San Quentin Prison just beyond the bridge on the left side when San Rafael bound. My World is a weekly meme hosted by the very same people who host Sky Watch. For more entries about other people’s world, click here. 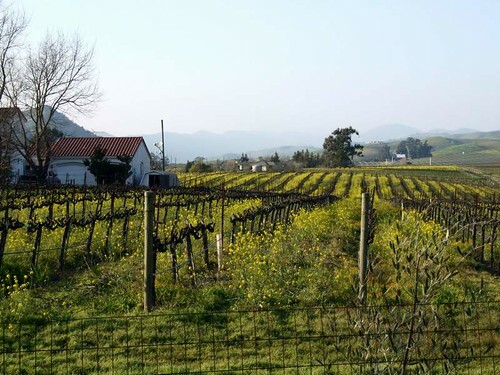 Have I told you that both Sonoma and Napa Valleys are only about 20 miles away? Well, both are easily accessible via Carquinez Bridge from the East Bay. During the first three or four months of the year, both valleys are covered in yellow from the yellow mustards. 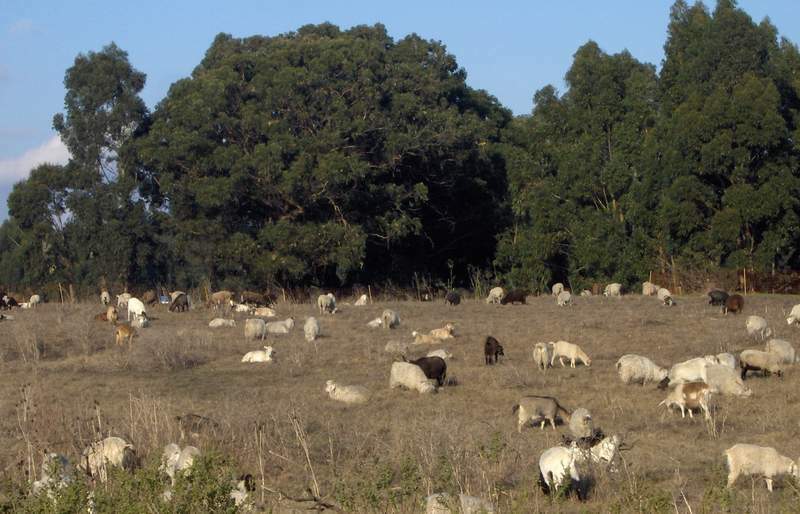 Over the years, whenever we have an afternoon free during the weekends, we would always opt to go to either one of the valleys instead of San Francisco even though they were the same distance from us. During this time, the valley is pretty in a different way. We would always make it a point to photograph the vineyards first then stop for coffee or grab a bite. I haven’t been in the valleys this year. And I know that it look like these three photos; it always has every single year. 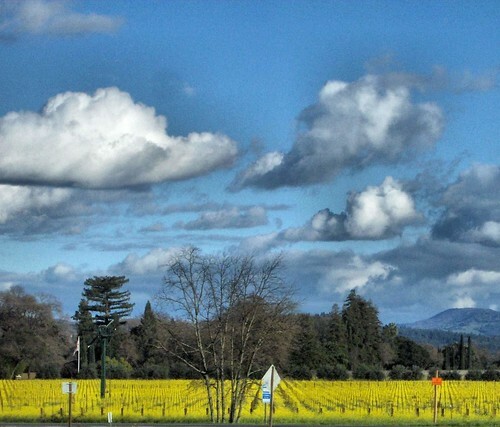 The first two photos are taken from Sonoma Valley; the third from Napa Valley. The third one may be a bit familiar. I used it for Sky watch before. I have posted these old photos to offer a little bit of sunshine to those fellow players who are still deep in winter and all they see are white and white and white. Here’s some yellow to every one. I will find a way to get to the valleys next week for some photo shoot. And I will share them here. 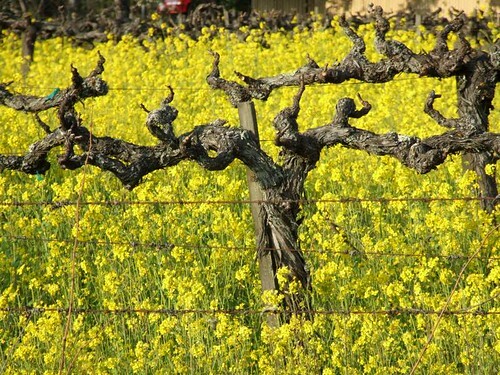 Napa Valley has an annual mustard festival in time for the mustard season. This is my entry for this week’s My World. For more photos and stories, check My World. I first saw them many years ago on the local news. They were being featured after they did “work” for the SFO runway. Apparently, there are some spots in the runway, where workmen are not allowed and for some reason, they can get access. I never paid any more attention to it. A couple of years later as I was a few yards from home, I hit a little traffic in this residential road. I noticed the people stopped their cars in the middle of the road to watch them do their work on the hillside. This particular hillside is a little steep that man cannot do the job. I thought that was funny that they get tapped to do the job. The following day, just as I was driving past that same spot, I saw their “ride”. 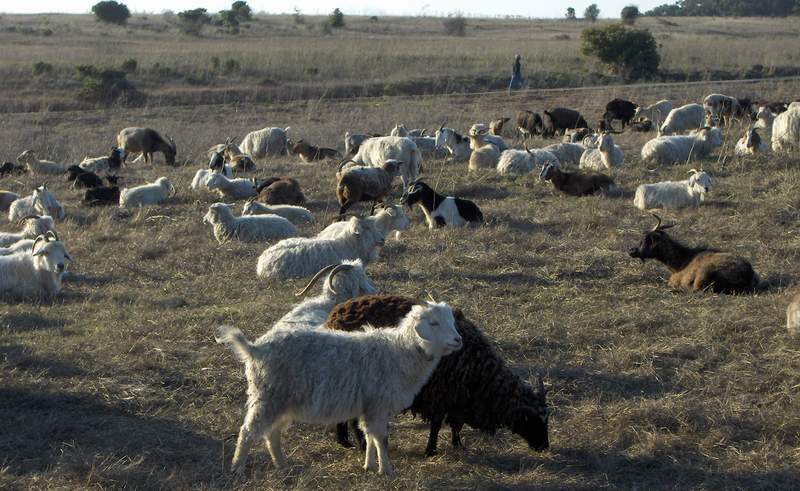 A trailer with the words GOATS R US was parked on the side of the road. Another year past and I was expecting to see them do their usual work of the hillside. But they were nowhere to be found. One weekend my hubs and I did our usual walk/photo shoot of our fave regional park, we saw them. They are now doing this work for the park for fire prevention purposes, as you know California has added fire as the fifth season of the year. And because I had come here to shoot and walk, I had my camera with me. Below are the shots I took from that walk. Taken at Point Pinole Regional Shoreline. 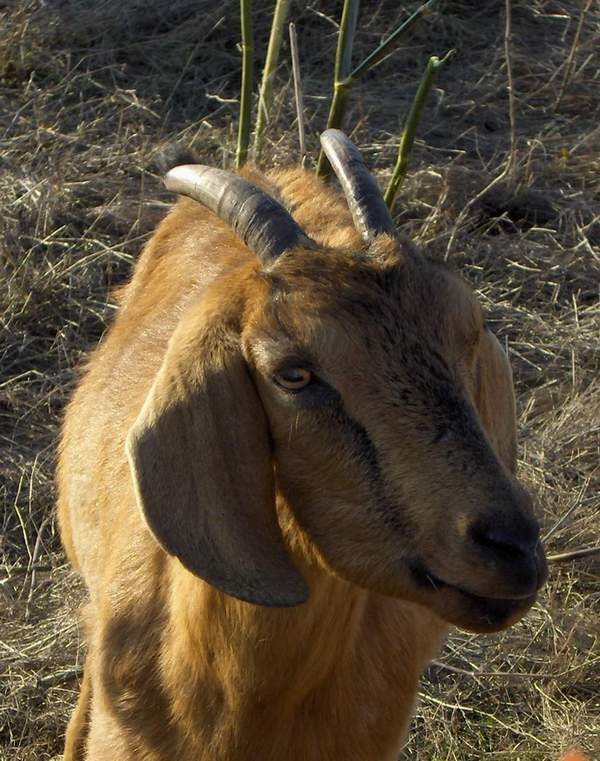 This spring I saw them in the neighboring city clearing hillside brush in the residential area again. I guess there will be no dearth of work to be done by these handsome beasts. Is there something similar to this in your world? I would like to know. Thanks. Would you like to see similarities and differences of your world to other bloggers? Check them out here.